Zombies are hostile undead mobs. They look very similar to the player, but their colors are different. Zombies spawn in dark places in the Overworld, which includes the surface at night. Besides spawning randomly, zombies will also spawn from monster spawners, making monster spawners a convenient way to get their drops. When killed, zombies drop 1-2 rotten flesh. They also have a chance of dropping rare items such as iron ingots, potatoes, and carrots. 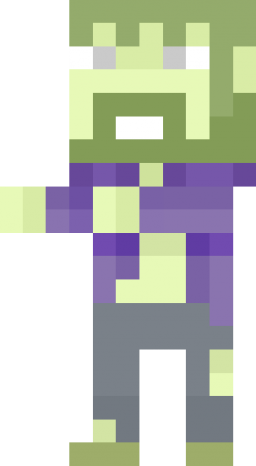 If a zombie gets close enough to the player, it will start following them in order to attack them. This isn't too much of a problem since zombies walk fairly slow and they have 20 health points (10 hearts). They are able to jump 2 blocks high, like the player. When a zombie comes in contact with light from the sun, it catches fire and take damage. It is a good idea to wait until morning to hunt for zombies because they will already be taking damage from the sun. 16 Slay a Zombie. Kill a zombie. A zombie taking damage from the sun. A zombie above the player. This page was last edited on 31 December 2018, at 05:55.